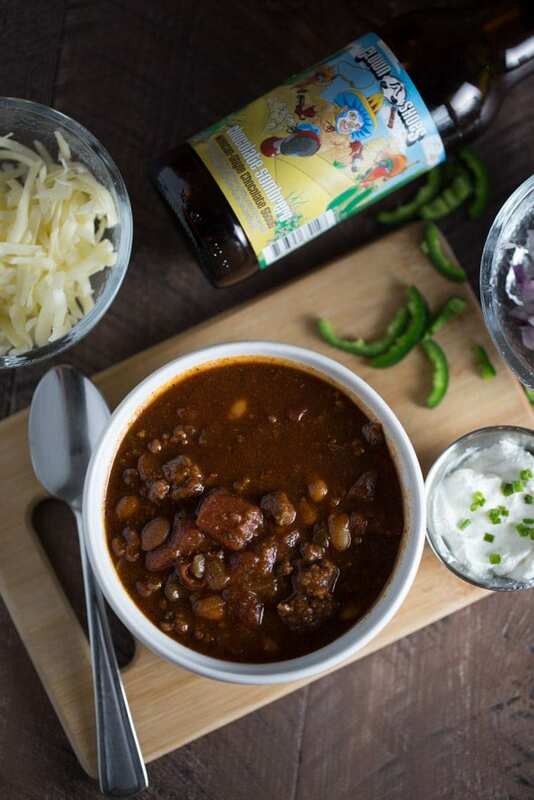 Stout Beer Chili is a thick, hearty and flavorful beer chili made with Clown Shoes Chocolate Sombrero Stout. The imperial stout has bold chocolate flavor as well as hints of vanilla, cinnamon and ancho chili pepper. 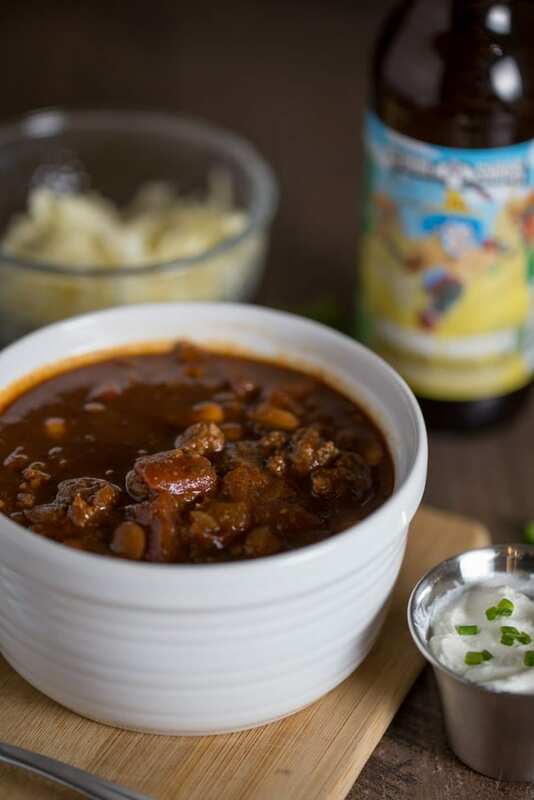 Coupled with the beef and chili spices, this stout lends complex flavors to my stout beer chili. A couple weeks ago a cold front passed through Florida. As a result, we had like two days of perfectly cool weather. It’s the kind of weather that prompts Floridians to break out the sweaters, jackets, jeans and yes, even beanie hats. Trust me, it wasn’t that cold outside but we will grasp at whatever we can get. Additionally, the cool weather means it’s the beginning of chili season. A stroll through the grocery store and a glance at the contents of wandering grocery carts will confirm this. CHILI INGREDIENTS! 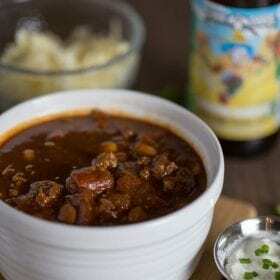 My stout beer chili is a perfect match for cooler weather. 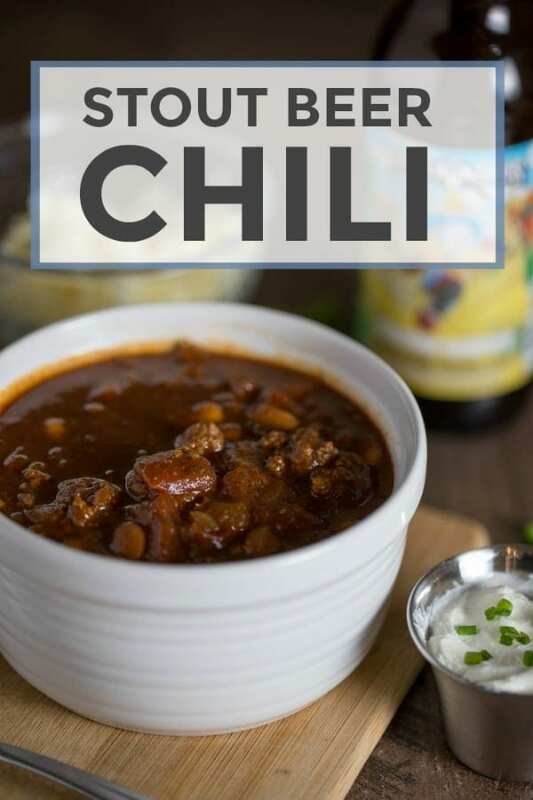 After your chili is ready to devour, you can top it with your favorite toppings. My favs are shredded cheddar, sour cream, sliced jalapenos and cilantro. What are your favorite chili toppings? Let me know in a comment below! 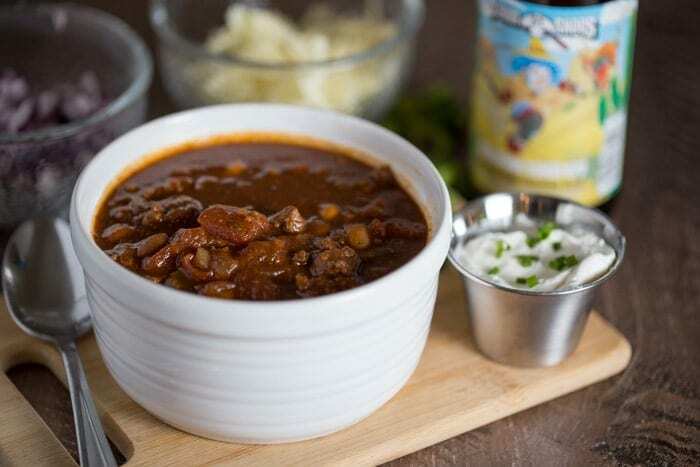 Thick and hearty chili that’s full of flavor thanks to the addition of a spicy chocolate stout! In a large pot, heat the olive oil over medium high heat. Add the Beef or Bison, jalapeno and onion. Cook until the meat is browned, 7-10 minutes. Meanwhile, make the chili seasoning. Whisk together all chili seasoning ingredients. After the meat is browned, add the chili spices. Mix well and and cook for 1 minute to toast the spices. Add the beer, tomato sauce, diced tomatoes, tomato paste, beef broth and beans to the pot. Stir to combine everything. Reduce heat and simmer uncovered for 1 hour. Taste the chili and add salt to taste.